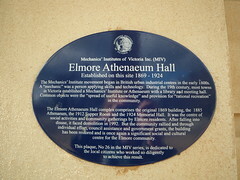 Elmore Athenaeum Hall. Established on this site 1869-1924. The Mechanics' Institute movement began in British urban industrial centres in the early 1800s. A "mechanic" was a person applying skills and technology. During the 19th century, most towns in Victoria established a Mechanics' Institute or Athenaeum with a library and meeting hall. Common objects were the "spread of useful knowledge" and provision for "rational recreation" in the community. The Elmore Athenaeum Hall complex comprises the original 1869 building, the 1885 Athenaeum, the 1912 Supper Room and the 1924 Memorial Hall. It was the centre of the social activities and community gatherings by Elmore Residents. After falling into disuse, it faced demolition in 1992. But the community rallied and through individual effort, council assistance and government grants, the building has been restored and is once again a significant social and cultural centre for the Elmore community. This plaque, No. 26 in the MIV series, is dedicated to the local citizens who worked so diligently to achieve this result.